libraryDependencies += "org.mortbay.jetty" % "jetty" % "6.1.22" % "container"
objc: Class JavaLaunchHelper is implemented in both /Library/Java/JavaVirtualMachines/jdk1.8.0_45.jdk/Contents/Home/jre/bin/java and /Library/Java/JavaVirtualMachines/jdk1.8.0_45.jdk/Contents/Home/jre/lib/libinstrument.dylib. One of the two will be used. Which one is undefined. appcfg.sh should ideally be run using Java 7 (also known as 1.7). 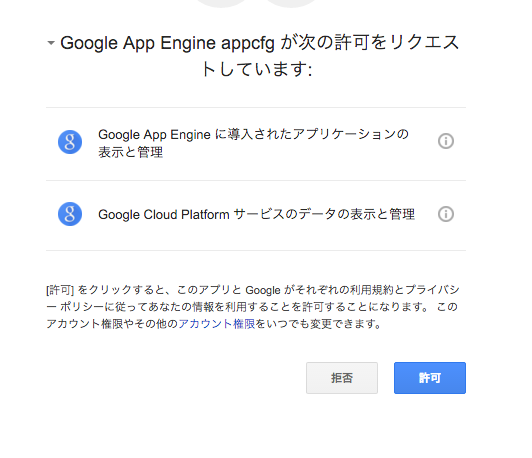 correct but do not work when uploaded to App Engine. You do not have permission to modify this app (app_id=u'dark'). Please see the logs [/var/folders/3x/tr8_68tx29v9skp0lv76ljvc0000gn/T/appcfg1764707419651306170.log] for further information.